Since yesterday was IPA Day, I decided to celebrate it last night with the biggest, baddest IPA around. 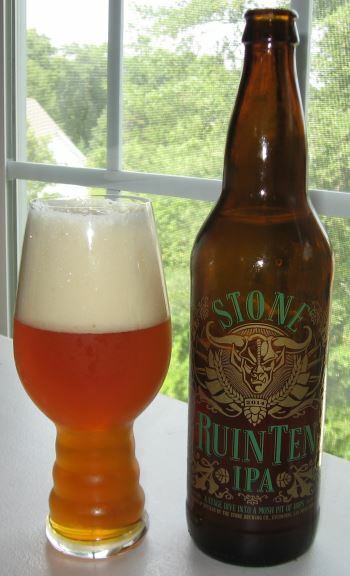 Stone’s RuinTen is an “extreme” version of their already insane Runation IPA which is an Imperial IPA designed to “ruin your palate” with over-the-top intensely bitter hops. So yeah, an extreme version of that. True to its billing, this is a big version of Ruination. I wouldn’t say that it’s any more bitter, however. It generally has the same flavor profile and intensity, but with a heavier body and more alcohol. They’ve cranked up the quantity of ingredients to get here, of course, but if any of it shows through, it’s a bit more citrus sweetness from heavy orange and grapefruit notes in the middle and finish than any additional bitterness. So overall there is a ton of pine, and a ton of grapefruit and orange, both bitter and sweet. The body is heavy, and the alcohol level is a relatively high 10.8% ABV. This is still a big, over-the-top bitter west-coast style Imperial IPA like Ruination, but if anything it’s slightly more well rounded and an excellent, excellent beer. This entry was posted in Reviews and tagged Ale, California, DIPA, Imperial IPA, IPA, Stone, West Coast IPA on August 8, 2014 by Xander.